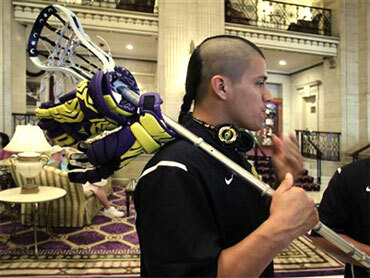 Members of an Iroquois lacrosse team who refuse to travel on U.S. passports were barred from getting on a flight Tuesday to the sport's world championship tournament because of a dispute over their passports. The 23 members of the New York-based squad arrived at a Delta terminal at Kennedy International Airport wearing team jackets and shirts. Their manager, Ansley Jemison, didn't expect to be allowed to board their flight to Amsterdam and wasn't surprised to be turned away at the check-in desk. U.S. officials previously informed the team that new security rules for international travelers meant that their old passports - low-tech, partly handwritten documents issued by a tribal authority - wouldn't be honored. But by showing up, the team avoided forfeiting its tickets. The airline allowed the squad to rebook its flight for Wednesday without penalty. Team officials remained hopeful that a last-minute diplomatic intervention would allow them to attend the World Lacrosse Championship, which is taking place in England. Jemison said he was confident tribal leaders could work out an arrangement with the U.S. State Department, get the necessary visas from the United Kingdom and make it in time for their first game on Thursday in Manchester. "Things are looking very good," he said, although he added, "We are on a crunch deadline." The Iroquois previously have traveled using passports issued by the Iroquois Confederacy. But the U.S. government says that, unlike U.S. passports, the Iroquois passports aren't acceptable under new, stricter immigration rules. The players won't accept U.S. government-issued documents because they see them as an attack on their identity. The British government, meanwhile, won't give the players visas if they cannot guarantee they'll be allowed to go home. Several lawmakers have urged the State Department to find a way to allow the team to travel but the department said there had not yet been a resolution to the case. Department spokesman P.J. Crowley said he was unsure if U.S. officials had been in touch with the team or its representatives on Tuesday. He said the government has offered team members U.S. passports if they want them. "The decision as to whether they accept that offer of assistance remains up to the team," he told reporters. Crowley said providing letters guaranteeing their readmission to the United States was not an option in the case of the team. Such letters are provided usually only in the case of emergency. "We are trying to see if there's a way to help them," he said. "The easiest way to accomplish what they want to accomplish is to get them a U.S. passport. We've been willing to do that, you know, for a number of days and we stand ready to do that today."